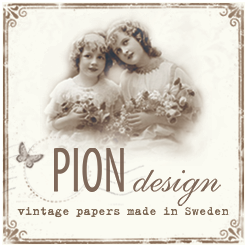 Pion Design is a family owned company located outside of Luleå in the northern part of Sweden. We are a manufacturer of scrapbooking papers in a vintage and romantic style and our papers are created and printed locally. Jenny Erickson established the company in the summer of 2009 as a result of her passion for paper crafting and photography. The name Pion Design derives from the flower Peony, Pion being Swedish for Peony. In the spring of 2010 we released our first original designed scrapbook collection. Today we are releasing several paper collections every year and our papers can be found in stores worldwide.